Yes, I *am* all about the food especially sweet treats, candy... all that fun stuff! 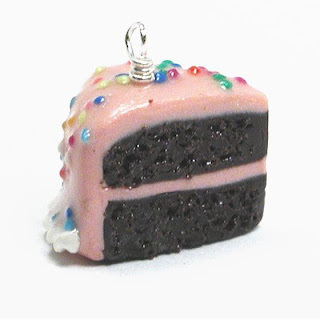 It's only natural that I'd be taken in by the charming yummy designs on offer from Inedible Jewelry. Good enough to *almost* eat, these charms & earrings encompass ALL food groups, healthy and decadent. Bagels, donuts, croissants, cheese, apples, hamburgers, cake ~~ they're all represented here. You can even have your own food fave made a la carte! Place your order & satisfy your appetite for unique accessories. Guaranteed you'll be hungry for more!